today was freezing and considering i was out my bed since 7 am… i had to think smart when it comes to layering… something i learnt from my parisian fellas… when it comes to layering they know best. but im not parisian [though i wish i was] and i love to dress up… its almost halloween so practice will help. 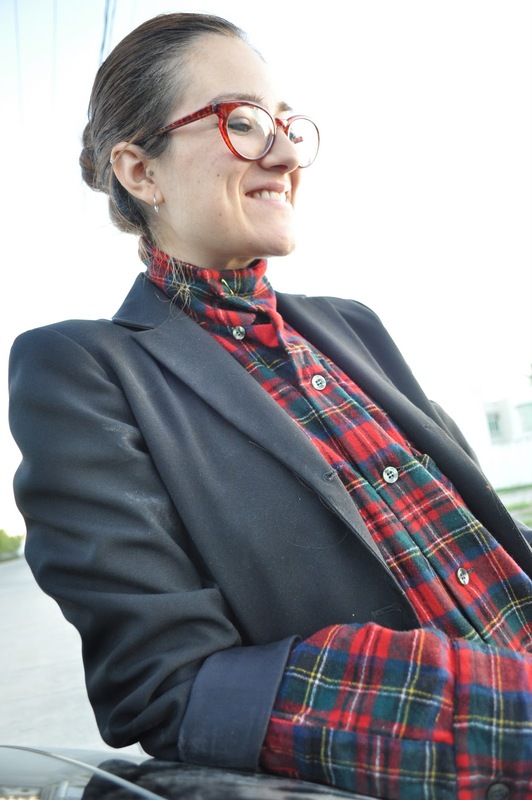 when i headed to my closet i started with this plaid shirt… flannel shirt… its super warm and its not crazy when the weather goes a little higher, and to balance the laziness of the boyfriend baggy jeans with the flannel shirt i added a blazer and high heels. thats all. hoy estaba helando y considerando que salí de mi cama desde las 7 de la mañana… tenia que pensar en capas… algo que aprendí de mis queridos parisinos… cuando se trata de capas ellos son pro. pero no soy parisina [aunque me gustaría serlo] y me gusta jugar a disfrazarme… casi es Halloween así que ir practicando me ayudara. Cuando me dirigi a mi closet empece con esta camisa de franela escocesa… es super calientita y aun no es bochornosa cuando se eleva la temperatura un poquito a medio dia, para balancear la flojera de los pantalones flojos con la camisa de leñador me puse mi saco y botines de tacon. Es todo. safety pin to change the collar… it helped me a little with the absence of the scarf… yes, i forgot mine. un segurito para cambiar el cuello… me ayudo a contra-restar la ausencia de la bufanda… si, se me olvido. and this babes… i changed the heel and resoled them… they look better now. y estos bebes [jaja es broma] les cambie el tacon y les puse otra suela… se ven mejor ahora.